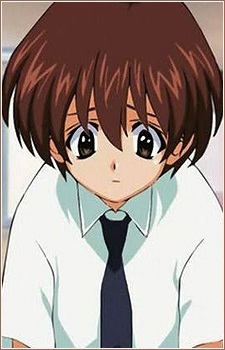 A plain boy no one seems to notice, Densuke was forced into the Eiken Club after an accidental run-in with Chiharu, whom he develops a crush on. He eventually accepts his place in the club, despite being tormented by Kirika and the other mishaps that befall him, i.e. being beaten, violently crushed (Kirika, Yuriko) or electrocuted (Kyoko) by other members. Densuke is frequently forced to cross-dress by Kirika, a hobby of hers.